Just getting started with container gardening? Don’t have much space to grow your own food? Try the EarthBox Organic Garden Kit for great yields with less work – works indoors, outdoors, or on a balcony or patio! If you are interested in growing your own fruits and vegetables, but don’t have a lot of available outdoor space, container gardening is a great option. There are lots of different containers out there of all shapes, sizes, and designs. One of the best out there according to many home gardeners and even some commercial farmers is the EarthBox Organic Garden Kit. This high-quality container is more than just a container – it includes everything you need to get started, including easy-to-follow instructions, so it’s perfect for “newbie” container gardeners as well. Created by commercial farmers, this tried and tested planter comes with high tech features that help to control the soil conditions and eliminate the need for any guesswork. Some users say it even doubled the yield of their fruits and veggies! Another great feature is that the container is designed to be self-watering and self-feeding. So, if you’re keen to start growing your own veggies but you’re worried about the amount of effort involved, this is the perfect solution for you. You also won’t have to do any weeding, as the container comes with reusable mulch covers to keep out any weed seeds if you’re placing the container outdoors, but of course, you will still have to watch out for pests and outdoor critters that may want to snack on your plants. Overall, this grow kit is extremely low maintenance, making it ideal for complete gardening beginners. You can use practically any type of soil you want, and still achieve great results. So, even if you feel like you’re prone to killing plants just by looking at them, you’ll have no problems with this garden planter kit! The EarthBox Organic Garden Kit has been designed with both small spaces and portability in mind. Complete with high-quality caster wheels, you’ll easily be able to move it from one place to another to take advantage of sun placement. The container is small enough to be used on balconies and windowsills, but what really sets it apart is that it’s so easy to use indoors because it is so portable – and it also won’t detract from your home decor. The Terra Cotta design offers a modern, stylish look, perfect for any home or garden. While it may look like real ceramic, the container is actually made from plastic. This makes the container extremely light and easy to move from one place to another – plus it is very durable and will last for many years. You can grow almost anything in this container, but most users have found it best for tomatoes, chilies, and herbs. The EarthBox Garden Kit measures 29″L x 14″W x 11″H and includes the EarthBox® container, Aeration Screen, Water Fill Tube, 2 B/W Mulch Covers, 1 lb. Bag of Organic Fertilizer, 1 lb. Bag of Organic Dolomite, and 4 Casters. If you’re just getting started with growing your own fruits and veggies, and you want to start with an easy, portable, and attractive container, you can’t go wrong with the The Earthbox Organic Garden Kit. 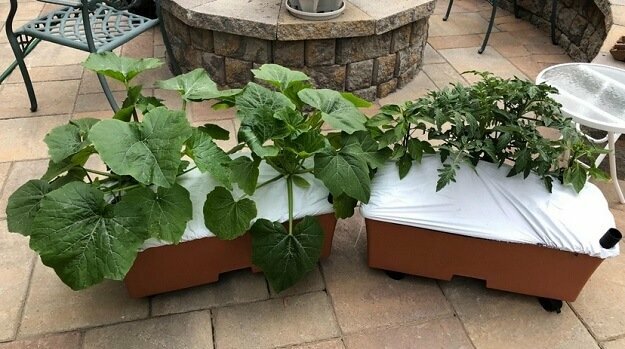 More than just a container, it’s a full growing system that makes organic gardening easy – whether you’re limited to a balcony or patio, or even growing indoors. You can purchase the EarthBox Organic Garden Kit on Amazon.com and other online garden retailers.